Good review, Jacqui. I’m glad you enjoyed it and thanks for the link. You’re very welcome, Naomi. Thanks for recommending it to me. Another wonderful review. I’ve heard nothing but praise for this novel, so I am looking forward to reading it. I think I will enjoy the prose in this book; you picked wonderful quotes. Thank you. I think you will love this one, it’s beautifully written. The final quote, the one where she cuts her father’s hair – it really got to me. Thanks, Cathy. I would be really interested to hear what you think of it. Others have likened Costello’s prose to that of Colm Toibin, but I haven’t read enough of him to give an informed view on any comparisons. I think you’d be in a good position (certainly better placed than me) to say how you think Academy Street fits into the landscape of Irish literature. Can’t believe although it’s 3 months or so since I read this, I know your review captures the story & essence of Academy Street perfectly… Definitely one that lingers! Have you read any of her short stories? Her collection The China Factory, first released in 2012, is being rereleased in May. Again she deals with key events in ordinary lives deeply & deftly. Tess will be hard to forget that’s for sure. I haven’t read any of Costello stories – it sounds as if you rate them highly. Great to hear that a reissue of The China Factory is on the way – makes perfect sense based on the success of Academy Street. It’ll be interesting to see what she does in the future too – another novel or a return to short stories? Many thanks for sharing this link, Poppy. I’m going to save it to read over the weekend (was hoping to get to it this afternoon but time got the better of me). I’m so glad you enjoyed this, Jacqui. I’m still astonished that it wasn’t included on the Baileys longlist – it seemed a dead cert to me. Many thanks for the link. You’re very welcome, Susan. As far as the Bailey’s longlist goes, I’ve only read the Ali Smith (which I loved) and Elizabeth is Missing, so it’s difficult for me to say…I guess it’s hard to predict these things! Yes, do feel free to add to add it to your post, Anne – thank you. I could have chosen several other quotes as Costello’s prose is beautiful – so spare yet so effective. As I was saying to Susan, I find it almost impossible to give a view on the Baileys as I’ve only read How to be both and Elizabeth is Missing! I have this book on hold at the library – I can’t wait to read it! Well, I hope you like it, Naomi! I’ll keep an eye out for your review. Sounds excellent Jacqui – I keep hearing good things about this one! While it sounds like an excellent debut. This isn’t quite my read, but thanks for the review. I think that’s a fair call, Guy. I’m not convinced that Academy Street would be a good fit for you. Oh, that’s interesting to hear. I’m quite intrigued by the emigration theme too as my mother, who was born in Ireland, moved to England in the early sixties when she married my father. My mother’s life turned out quite differently to Tess’ experience of New York, but Academy Street got me thinking about her childhood in Ireland. Tess would have been seven or eight years younger than my mother, so they came from the same era and culture. Families rarely discussed death at that time; everything was internalised, and emotions were buried…Tess’ childhood rang true for me. Academy Street is worth a look (once you’ve worked your way through the IFFP longlist, of course). It’s a good debut. The style will suit some readers but not others – the quotes should give you a good feel as to whether it would work for you. I have just bought this after a recommendation by a friend. Looking forward to it. Cool! I think you’d like it, Ali. It’s a quiet story, beautifully told. Let me know how you get on with it – I’ll keep an eye out for your review. This is one of those books I’ve picked up and put down again God knows how many times. I thought it might be a poor man’s version of Colm Toibin’s Brooklyn or Nora Webster both of which I loved! The excerpts and your review tell me I might be wrong – next time I pick it up I will leave the shop with it! Haha, I’ve done a similar thing myself in the past! I’d be very interested to know how it compares with Colm Toibin’s novels, Col, as I haven’t read enough of him to give a view. Nora Webster is in my TBR pile, but I’ll probably leave it for a few months just to put a bit of space between the Costello and another book in a similar style/tone. Brooklyn is another I ought to get to at some point. That said, I think Academy Street is more than strong enough to stand on its own – it’s a very good debut. I wouldn’t say it’s my favourite novel of the year, but I admired it very much. Costello’s prose is very spare, but deceptively affecting. I don’t know how she manages to do it, but she makes you feel as if you are privy to Tess’ inner thoughts and feelings (even though it’s written in the third person). Let me know how it goes if you do give it a try. Thanks for sharing my link – I’m glad you enjoyed it too. I’m disappointed that it didn’t appear on the Baileys longlist! You’ve very welcome. Yes, several people have commented on its omission from the Baileys longlist. It’s so difficult to predict these things, isn’t it? Lots of people were tipping Mathias Enard’s Zone for the IFFP longlist, and it’s another one that seems to have been overlooked. In the meantime, I hope you enjoy your IFFP reading with Stu and the other shadowers! Thanks, Gemma! I think you’d love this book, it feels right up your street. Several others have also described it as a story about a quiet/reserved life, a life lived on the fringes, but no less important for that. It’s deeply moving but never sentimental, quite a delicate balance to pull off. Great review, Jacqui! I think the comparisons with Brooklyn are inevitable as they share the same basic story – but that doesn’t mean there isn’t a ton of different ways of telling it! I’ve seen it about a lot, and glanced at reviews of it, but I’d no idea it was a debut – either that, or I’d forgotten. From what you’ve quoted, she seems a very poised and assured writer. Thank you! I haven’t read Brooklyn (not quite sure how it passed me by!) but from what I’ve heard about the storyline I think you’re right – the comparison is inevitable. That said, Academy Street does feel strong enough to stand on its own merits. I like your take home message on Costello’s writing – it’s a very assured debut, and it’ll be interesting to see what she does next. This sounds wonderful – and a new book in an old tradition perhaps. Yes, there’s something timeless about the story and Costello’s prose style. I think you’d like it. This sounds really good. It seems perfect for Irish reading month. I am a glutton for strong emotion in books so the melancholy that you mention is ironically something that I would likely enjoy. Yes, I wanted to review something for Cathy’s Reading Ireland month, and this one seemed to fit the bill. (It was a case of searching my shelves as I’m reading from my TBR right now!) It’s a good one if you’re after something quiet and deeply felt. Others have compared Costello’s prose style to that of Colm Toibin – it’s in that kind of space. I’ve read a couple of Costello’s short stories and quite enjoyed them so I may pick this up at these being common experiences. As you noted, emotions and emotional events were dealt with by burying them and hoping they’d go away. I’m sure I’ll find this sooner rather than later on the charity shop shelves. Irish novels are easier to find than any others. Yes, that aspect of Tess’ story felt very true to life. I’m sure you’ll be able to pick up a copy in the charity shops – the paperback came out at the beginning of March so there should be plenty of copies about. Interested to hear what you think of it, Seamus. It’s difficult not to think about Brooklyn by Toibin when reading your review. I’m not sure I’m up for another one about the shy Irish girl moving to New York. Brooklyn’s the obvious comparison, definitely (although I’ve yet to read it myself). That’s fair enough – I don’t think this novel’s going to appeal to every reader. Sometimes it’s better to try something new or different! This novel seems to have received a lot of praise but I’m not sure it’s for me. I read Brooklyn years ago and, while I didn’t find it terrible or anything, I equally wasn’t particularly taken with it. I do wonder whether there are innate reading prejudices which even the best writers struggle to break through! Possibly…I might be at risk of perpetuating another prejudice here, but I think this is a novel that will probably appeal more to women than men. That’s not to say male readers won’t like Academy Street or get something from it, but the subject matter and Costello’s style almost certainly won’t suit every reader. I saw Mary Costelloe being interviewed at a Dublin literary festival and found her views on writing very insightful. Also read the China Factory and liked it so I’ll give this one a try. Thanks for the review, another book to add to the ever expanding reading pile! Sounds like a very interesting event. This novel is well worth a try especially if you enjoyed her short stories. (Sorry to add to your TBR pile, it never ends doesn’t it?). It looks as if Canongate are planning to re-issue The China Factory so I’ll have to look out for a copy – one to add to my own TBR tower at some point! It sounds good, but maybe also that it suffers from that gloom so common to Irish writing. Sensitive people, suffering silently. Beautifully written but quiet. At the same time, you do seem very taken by it. 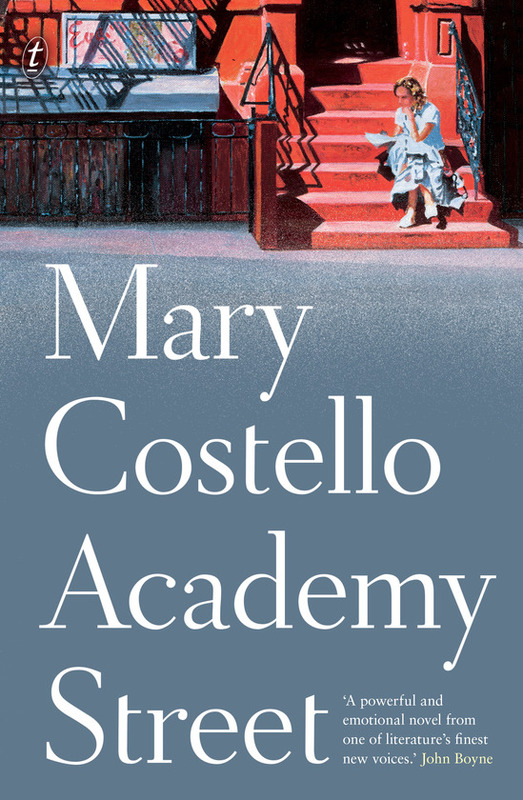 Are you planning to read more Mary Costello? That’s a fair point, I think. There isn’t quite the same sense of life opening up here as there is in Toibin’s Brooklyn, for example. That said, it’s a book that still sits well in my memory, so yes, I probably would read another by Costello. (Her prose style is very gentle.) There’s a collection of short stories — The China Factory — which sounds interesting, but I might wait for another novel (assuming there’s one on the way).